Solpadol is a powerful painkiller. The active ingredients in this medicine are paracetamol and codeine. Paracetamol blocks the transmission of pain signals before they reach the brain and codeine suppresses pain signals. These two substances combined are a powerful painkiller which helps to relieve severe pain. Solpadol is prescribed to treat severe pain from, for example, an operation, illness or injury, muscle and rheumatic pain, the flu (especially with dry coughing), headache and other pain symptoms. Solpadol is used when other painkillers are not effective or not effective enough. Solpadol is most effective when taken before meals. Dissolve the (effervescent) tablet in half a glass of water, stir well and drink immediately. If you have forgotten to take a dose of Solpadol, take it as soon as you remember. Please note that the regular interval between the doses is at least four hours. Never take a double dose of Solpadol to make up for the missed one. See the package leaflet for more information on missed doses. 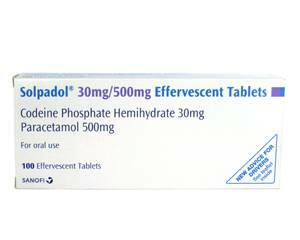 Solpadol contains 500 mg paracetamol and 30 mg codeine per tablet. Solpadol is available as effervescent tablet in packs of 32, 100 and 232 tablets, and as regular tablet in pack size of 100 tablets. The usual dose for an adult is one or two tablets every four hours, with a maximum of eight tablets a day. However, we advise that you follow your doctor's orders when taking the medication. Solpadol in the above strength is not suitable for children under the age of 12. The appropriate dosage for children aged 12 to 18 years should be determined by a doctor. Solpadol should only be used in consultation with a doctor if you are pregnant or breastfeeding. Alcohol intensifies the effect of Solpadol. It is advisable to reduce or stop drinking alcohol while you are taking this medication. Solpadol may cause you to feel dizzy, drowsy or sleepy. Please be aware of this and do not participate in traffic if you are experiencing these side effects.